Billy Moore Correctional Center, sometimes referred to as Moore B., is a minimum custody prison located in Overton Texas that houses a maximum of 513 adult male inmates. 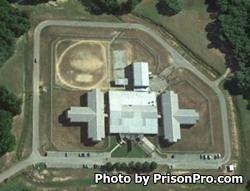 Billy Moore Correctional Center is a privately operated institution under a contract between the Texas Department of Criminal Justice and MTC (Management Training Corporation). The facility is comprised of six general population dormitories (A, B, C, D, E, and F Dorms). Each dorm can house 84 offenders in 42 double occupancy cells. Multiple educational programs are available to inmates housed at Billy Moore Correctional Center. All eligible inmates are encouraged to take adult basic education courses and obtain their GED. Vocational training offered at Moore B. includes electrical wiring systems, computer skills/keyboarding, blueprint reading, custodial work, and painting. Additional courses provided to offenders include life skills, anger management, and alcohol/substance abuse education. Inmates housed at Billy Moore Correctional Center range in age from 20-77. The average duration an inmate is incarcerated at this facility is for approximately 301 days. Inmates are allowed visits from approved visitors on Saturdays and Sundays from 8am to 5pm. Offenders are allowed only a single visit per weekend (either Saturday or Sunday). All visits are approximately two hours in duration, however if the visiting room becomes crowded or other extenuating circumstances arise the visit could be shorter.